The ABCD chart pattern is a pattern that I learned from Investors Underground while watching their YouTube videos. (Yes, you can still gain something from YouTube videos...not everything is crap there). The trading instructor there, Nathan Michaud uses it for day trading and in the 1 minute chart. Ever since learning about it, I have been able to see it happening even in the 60 min charts. No doubt you will also be able to spot this pattern in the daily, weekly and other time frames. One of the amazing things about chart patterns is if you can find it in one time frame, you can often find the pattern in multiple time frames. Therefore, if you learn this chart pattern, you will be able to utilize it in your preferred time frame to trade stocks. If you want a basic understanding of the pattern, I highly recommend you go to the source. You can find an introduction the chart pattern at Investors Underground page about the ABCD Chart Pattern. They have a nice diagram and short description about the pattern there. I'll show you my own example that I have found. 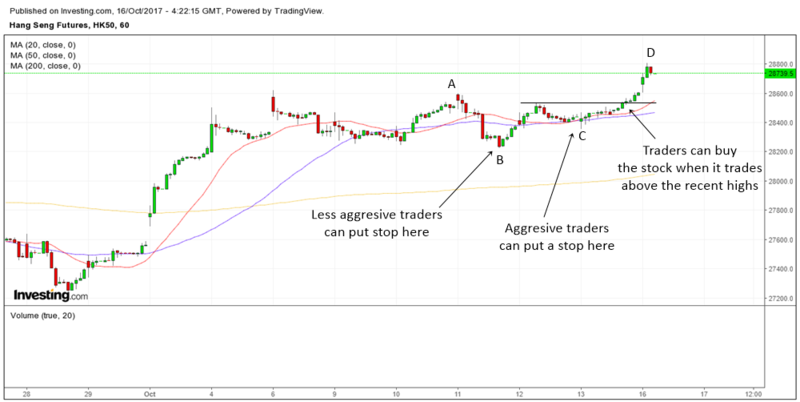 Take a look at the 60 min chart of MCD below. In the chart above, you can see how MCD had a nice gap up and topped out at "A" as it hit the 60 min 200 MA. It then declined for a day and formed a short term low at "B". 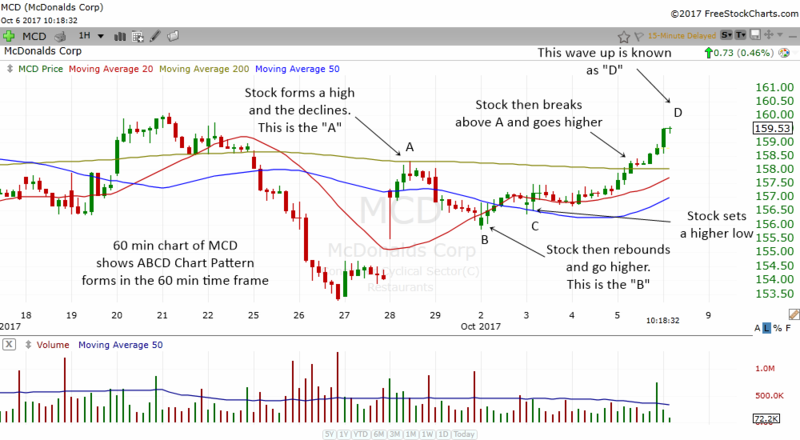 MCD then rebounded higher and set a higher low at "C". The stock then drifted sideways and then broke out above "A". The entire ABCD pattern is a bullish continuation pattern which can often produce very good returns. Traders can buy the breakout above the consolidation after "C" and put a stop loss below the lows in "B". Aggressive traders can put a stop loss below the consolidation. The ABCD can often produce powerful moves up. This is very true if the stock is in an uptrend. A trend in motion tends to stay in motion and therefore the stock can often move up quite a lot after the breakout. 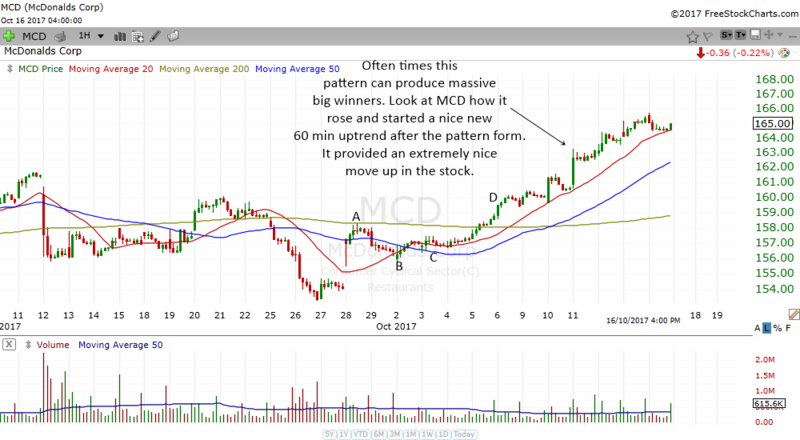 The chart above is the same 60 min chart of MCD but fast forward a couple of days. That is the power of the ABCD chart pattern. Once the stock breaks out, there is a possibility of it moving higher if the stock is in a nice uptrend. Traders can often use the technique of scaling out in this kind of situation. The trader can sell 1/3 or 1/2 of the stock as it rises. Then he or she can use a trailing stop loss to take profits on the other positions. I combine this pattern with my knowledge of moving averages. If I see the stock above the rising 20 MA and rising 50 MA, then it is very possible that it will have a nice uptrend. Not only does this pattern appear in different time frames, it can also appear in futures as well. The chart below is the 60 min chart of the Hang Seng futures. Notice how the ABCD pattern formed nicely in the 60 min chart of Hang Seng? Traders can initiate a long position when it traded above the highs of the consolidation. Aggressive traders can put a stop at the low at "C". Less aggressive traders can put a stop loss at the lows at "B". While this pattern is not a common pattern, it is still good to be able to recognize this chart pattern. The more bullish continuation patterns that you learn, the better you will be able to spot trading opportunities. If you are holding a stock, knowing a lot of chart patterns will also give you confidence to hold on to it longer. Learn the ABCD chart pattern well and you might be able to spot great trading opportunities in the future.